What an amazing difference! I’ve read that if you only have one spiral cutterhead in the shop, that you should put it in your planer. After all, don’t you plane to final thickness? Well, I finally installed the Shelix head after buying it over 6 months ago. It took about 4 hours, including several interruptions from watching and playing with my twin granddaughters. I took a few photos, but their instructions that I downloaded from their website were very clear for someone familiar with snap ring pliers and chain tensioners. Just go slow and keep track of the order you take off parts. Here’s a pic of it installed. Before I had to wear earplugs and could only take .01-.02″ off 6″ red oak without tripping the breaker. Now I can easily take .04-.06″ without bogging down at all and there’s no need for earplugs. And the finish is glass smooth. Money well spent. 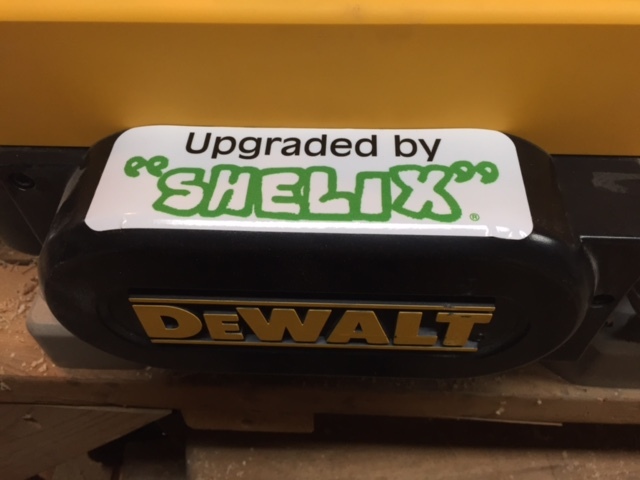 With these Shelix heads and the Wixey electronic digital readout, it’s the perfect setup for a home shop!